Danger Will Robinson. The Shire‘s Sophie & Vernessa make a return to TV this week with a fleeting appearance on The Checkout. · Total Sell Outs – Craig looks at the business of event ticketing to find out why he can’t get tickets to the Taylor Swift concert. The Checkout examines the allocation of concert and sporting event tickets and what impact scalpers and ebay have on instant sell-outs. · Spoilt for Choice: Toothpaste – Jules goes toothpaste shopping and finds a ridiculous amount of product differentiation that’s a real mouthful. Find out what’s the best buy: Triple Action, Deep Action, Multi-Action, Five-in-One Action, Dissolvable Mini-Breath Strips, EnameLock, Micro-Cleaning Crystals, clinically proven Pro-Argin™, Novamin, ProNamel, Microactive Foam, Microactive Foaming Bubbles, or Iso-active Foaming Gel. And Dr Mark Schifter, dental expert from the University of Sydney explains what really matters. · Milk. White Lies & Permeate – Kirsten heads to the farm to answer the question no-one’s actually asking … what the hell is permeate? And why milk companies are now boasting that they don’t use it. 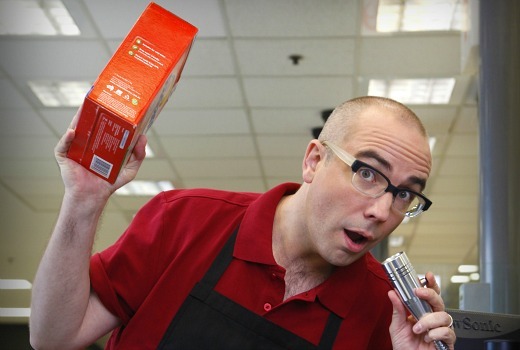 · A Load of Rubbish – Jules looks at Obsolescence…..printers, razors, light-bulbs, washing machines and even Apples – products that are designed to be thrown away, and marketing that’s designed to make you not want them. · As a Guilty Mum – Kate presents the Guilty Mum’s guide to keeping your child dangerously safe – from baby knee-pads, walking wings, infant protective safety hats, harnesses and even a GPS tracking device for kids. · Extended Warranties – consumers are constantly being flogged extended warranties (especially for cars). Scott Abbot asks what they do and don’t cover, and reveals what to say to people trying to sell them to you. · IF I Could Say One Thing – Professor Allan Fels, former Chairman of the ACCC, outlines how to avoid “bill shock” when travelling overseas with smart phones or tablets. · F.U.TUBE – more video F.U.s from disgruntled Aussie consumers. Thursdays at 8:00pm on ABC1. More Apple basing I see this week (well just saw). It’s clear Apple is not alone in this but they steam to stick it to Apple most weeks. I’m amazed the extended warranty didn’t mention Apple Care. @steviem hey this week on the voice some people are going to get eliminated. On the news some bad things have happened and on ready steady cook Colin Lane will be awkward. Now you have no reason to watch tv this week. How many more eps in this series? @steviem, and that’s David’s problem how? Give the poor guy a break. any idea if it’s been renewed for another season? I’m loving this show. it’s educational as well as bloody funny sometimes!